We all love avocado toast, but sometimes you just need to bite into a big-ole sloppy, juicy burger. Getting hungry? Lucky residents of The Pearl, you don’t have to travel far to sink your chompers into some of the best burgers in LA. Koreatown is at the epicenter of some mighty good eating, so let’s get this party started! When Al Cassell opened Cassell’s Hamburgers in 1948, it became an instant icon in the LA lunch counter scene. After Cassell passed away in 2010, the restaurant was purchased by Hotel Normandie. Since then, the historic 1928 hotel has been beautifully restored and Cassell’s Hamburgers was reborn in 2014 as a storefront on the ground floor. 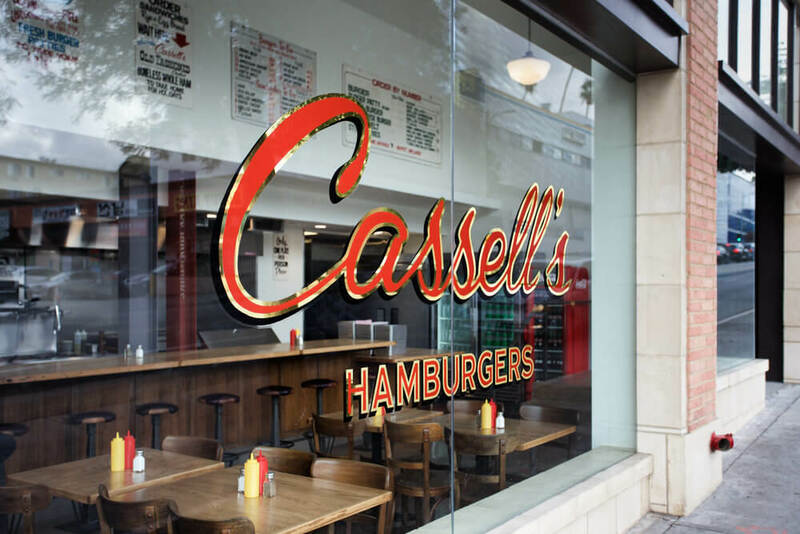 The original wooden Cassell’s sign festoons the lively retro-inspired interior, while the soul of the restaurant stays true to founder Al Cassell’s original principles of being a hamburger shop with a focus on premium beef, ground daily in house. All burgers are cooked on Al Cassell’s famous original crossfire broiler, ground with the original grinder, and pattied with the original press. Cassell’s uses many of the legacy recipes, but the menu has been expanded to classic milkshakes and malts, a 50s breakfast menu, coffee bar, house made pies, and a fully stocked bar. We dare you to deny you’ve ever wended your way to Tommy’s Original World Famous Hamburger after an appetite-inducing night on the town! Open 24 hours, the Shack, as it’s affectionately known, is a favorite of the nocturnal crowd, especially after Dodgers games. 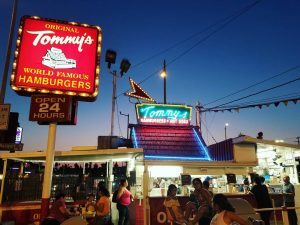 Since 1946, the Original Tommy’s hamburger stand has been serving burgers, fries and hot dogs, topped with their signature chili, from a walk up window where the only dine-in option is a stainless steel countertop. While there are dozens of locations in California and Nevada (including imposters), Tommy’s Original World Famous Hamburgers on Beverly Boulevard in Westlake is the bomb. Not a night owl? Tommy’s serves breakfast, lunch, dinner, and coffee. A Washington, DC area favorite since 1986, Five Guys has grown a cult-like following with over 1,500 locations worldwide, including a spot on the Champs-Élysées in Paris. Five Guys might be a popular chain, but don’t let that hold you back. This joint makes a mean burger, hand formed, using only fresh ground beef grilled to succulent perfection, along with fresh-cut fries cooked in pure peanut oil. Beyond the litany of burgers, Five Guys also offers hot dogs, including Kosher Style, and veggie sandwiches. Patrons can choose from an array of free toppings like Grilled Mushrooms, Jalapeño Peppers, Relish, and Green Peppers. Handspun vanilla milkshakes are served with or without whipped cream, along with your choice of free mix-ins such as Bacon, Bananas, Cherries, Oreo Cookies, Peanut Butter and Salted Caramel. No list of burgers would be complete without a vegetarian option, right? Monty’s Good Burger is a plant-based concept started by restaurant vets and creatives with a passion for real, quality food. 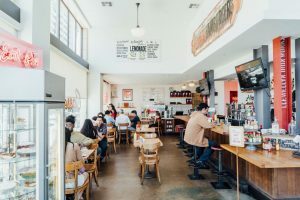 After wowing omnivorous audiences at festivals and pop-ups, the collective behind Monty’s Good Burger set out to launch restaurants in L.A.’s Koreatown and The Riverside Food Lab in Riverside, California. Featuring artisanal burgers made from locally sourced ingredients, housemade sauces, and the plant-based Impossible™ patty, the burgers are also a good option for carnivores who care about the environment, as Monty’s Good Burgers require 75-80% less environmental resources than animal meat. The restaurant serves up refreshing fountain sodas made with pure cane sugar, sparkling house-made lemonade, cookies made by Rocco’s Sweet Shoppe, handcrafted sides, and shakes blended with Soy Ice Cream. Burgers feature buns by Bosch Bakery, plant-based cheese, and Vegenaise® (mayo) from Follow Your Heart®, a locally owned, family business for over 30 years.